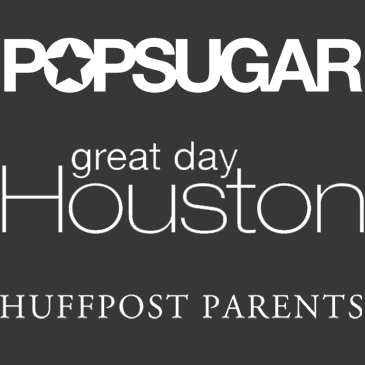 You guys, I am so excited to share this super fun DIY with you today. 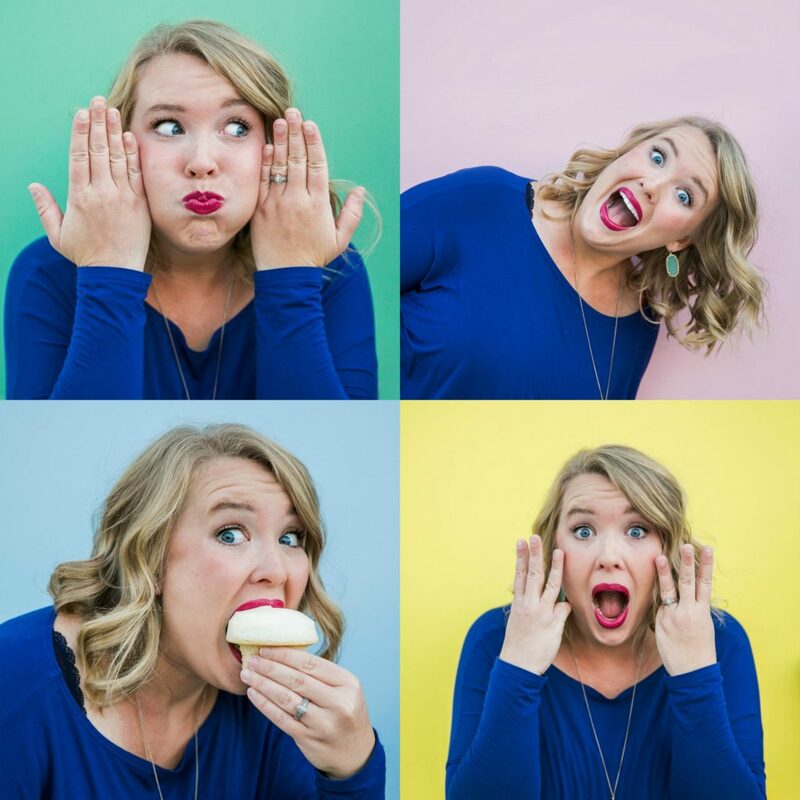 Like the rest of the world right now, I am obsessed with Fixer Upper on HGTV. I am so obsessed it may be border line creepy. Did you know that I am totally like BFF’s with Chip and Joanna? I am, I really am…they just don’t know it yet. Obviously I know we are not friends but I sure do love their decor style. I have always been a huge fan of the Farmhouse Rustic style and the way they execute it is just pure perfection! One of the design pieces I am loving the most are Wooden Signs. I love the idea of words in our home being a reflection of who we are as a family. These signs are gorgeous but oh so expensive. Because I did not want to spend an arm and a leg on one of the beauties I knew I had to figure out how to make my own. 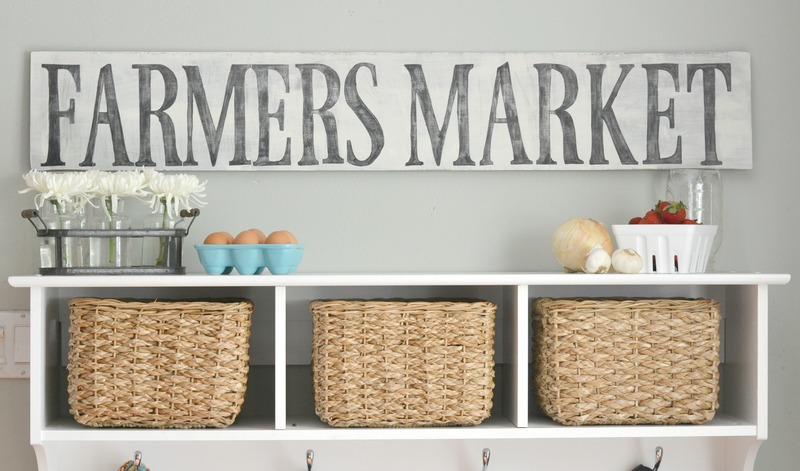 Today I am sharing with you 2 techniques to make these Easy DIY Wooden Farmhouse Signs. I am telling you friends, these techniques are so easy my kids even helped. And no, I did not have to freehand the lettering! The first technique I used in creating one of my signs was by using modge podge. I know, so easy! Before we can get to the fun part we have to create our canvas. We are using a chalk paint for these pieces of art because it is more porous. First things first, sand down your plywood so the paint will stick to the wood now paint the plywood with your chalk paint. Make sure that you cover it well. Once your board is painted it is time to stain your frame. Using your old t-shirt dab it into the stain and rub it into the wood studs. You can do as many layers of stain as you wish to make it as dark as you want but make sure each layer is completely dry before applying the next. Once all pieces of wood are dry it is time to apply the studs to the plywood. Using wood glue, we are going to adhere the studs directly to the plywood. The 30 in pieces will go on the 30 in side of plywood and the 32 on the 40 in side. Apply a generous amount of wood glue to the back of the stud and glue onto the plywood. Repeat this step with each stud until all are glued down. You may want to use heavy books or something heavy to ensure that they seal correctly. Allow this to dry over night. Now for the fun part, the wording! For our sign I wanted to do a Bible verse. I wanted a verse that reflects our family and one that is a constant reminder of who we are as a family. 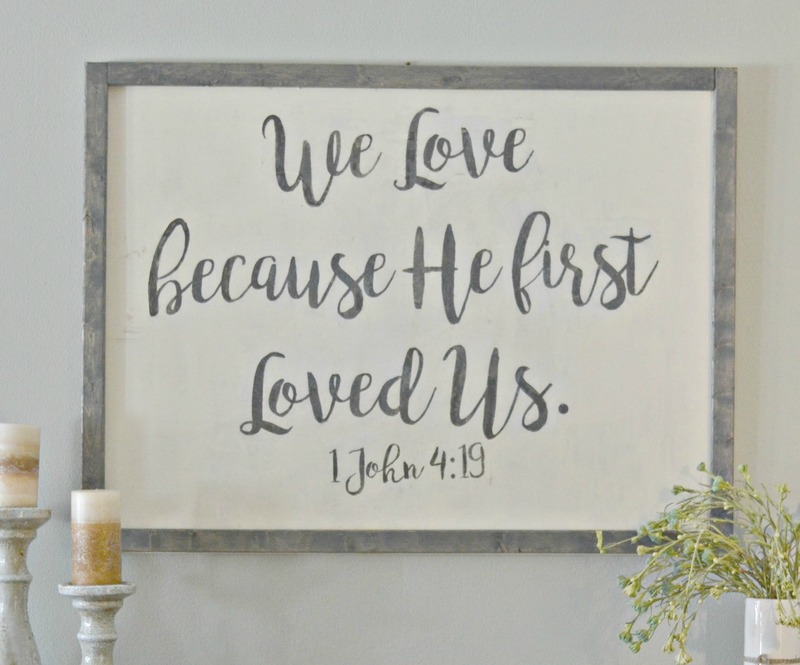 I chose 1 John 4:19, ” We Love because He first Loved Us.” I absolutely love it! Once you find the verse or phrase you want to use for your sign it is time to find a font. Remember that this is something you are hanging in your home so make sure choose a font you LOVE. Do not be afraid to purchase a new font! After you have found your font and your wording it is time to figure out spacing. I created mine in PicMonkey. Create a new design and then flip it mirror image. 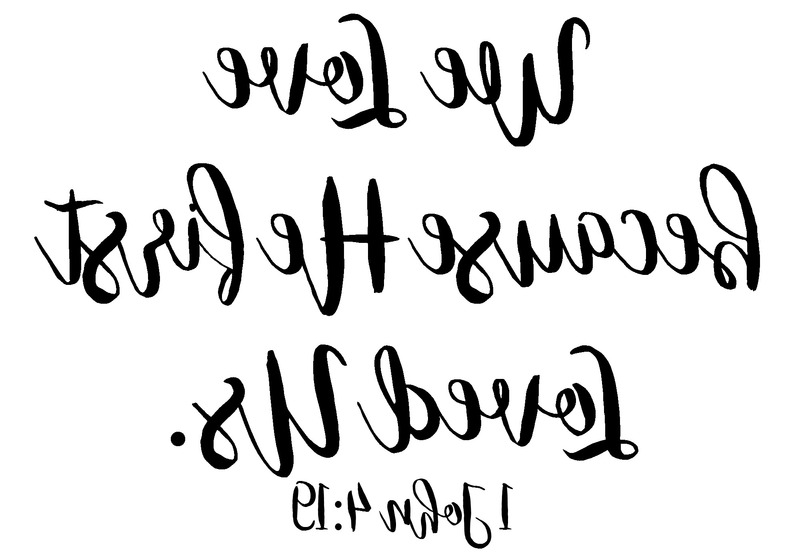 Here is a free printable of the one I used if you like it! Once your wording is created in mirror image it is time to print it. I had mine printed in a poster size on regular printer style paper. Now, here is an important step. Before you move forward, cut off as much excess paper as possible. One the side that your lettering is paint on a generous amount of modge podge. Once the lettering is covered flip it over and apply it to your framed board. Let dry completely. After the paper is dry take your wet rag and gently remove the back of the paper. What will begin to happen is the back layer of the paper will come off and the modge podged letters will stay! It’s like magic! Remove as much paper as possible. If your sign does like mine, you may have to go back and paint in any spot that may have pulled off or you could get lucky and the entire print will adhere perfectly! Below is the tutorial I watched in order to master this technique! Friends, this was so easy to do and did not take a lot of time at all. To purchase a sign this big I would have been looking at well around $400. By the time I purchased all of my supplies I did this sign for about $60. I would say that is a pretty good savings! I also love that I got to customize it completely to match my home. 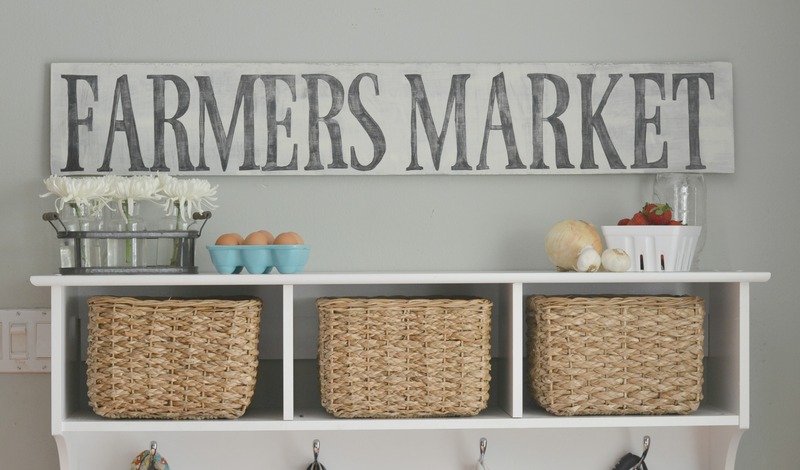 If you are looking to make a smaller sign I have an even easier technique that I found and uses to make this super cute Farmers Market sign for my kitchen. How cute is this? Ok, if you think the last sign was easy this one is even easier! Before we get started, you must sand down this board as well. Remember, we cannot miss this step or the paint will not stick. I just did a quick light coat for this wooden sign, I wanted it to have a rustic feel to it. Next, choosing a font. For this sign I chose the font Ferrum on Pic Monkey. Determine the size you need your lettering to be flip it mirror image and print it. Mine looked like this below. Once you have each letter printed cut off all excess paper. Now, it is time to figure out spacing. Lay out all of your letter across the board and tape them in place. For this technique you must tape them down or your letters will get messed up. After your spacing is just how you like it take a wet rag and wet the back of each letter. You will want to make sure that the letters are fully saturated and that you can see the letter through the back layer of paper. Now, before it starts to dry take the end of a sharpie and rub over the back of the wet letters. You want to make sure that your outline each letter with the plastic end of the marker. What starts to happen is that the ink from the paper starts to transfer onto the wood. So stinking cool! After you have “traced” and “colored” in all letters gently remove all of the letter backings and gently wipe off excess water. Allow sign to dry over night. The next day, take your sharpie and go over the outline of the letters. Do not worry about the outline being bold, we will distress it later. Now it is time to paint! Using the acrylic craft paint fill in the outlined letters. I again just did one coat as to not make the lettering too bold. After the piece is dry take the sand paper and gently go over the sign distressing it in some areas and dulling the words in others. This was my favorite part! 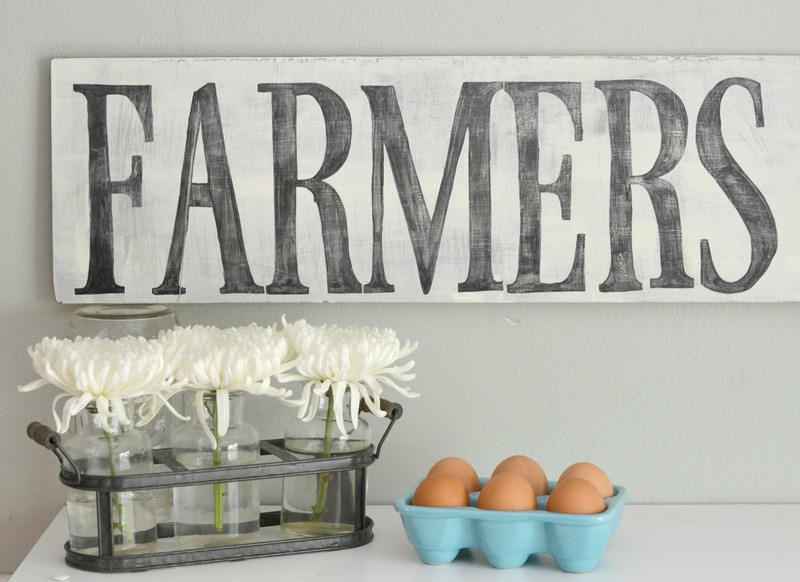 Once your sanding is complete take your wet rag and gently wipe off your wooden farmhouse sign. I cannot wait to hang this sign above my kitchen sink. We are in the process of changing our light fixtures in our home and making this more farmhouse rustic industrial looking. This sign is going to be the perfect compliment! 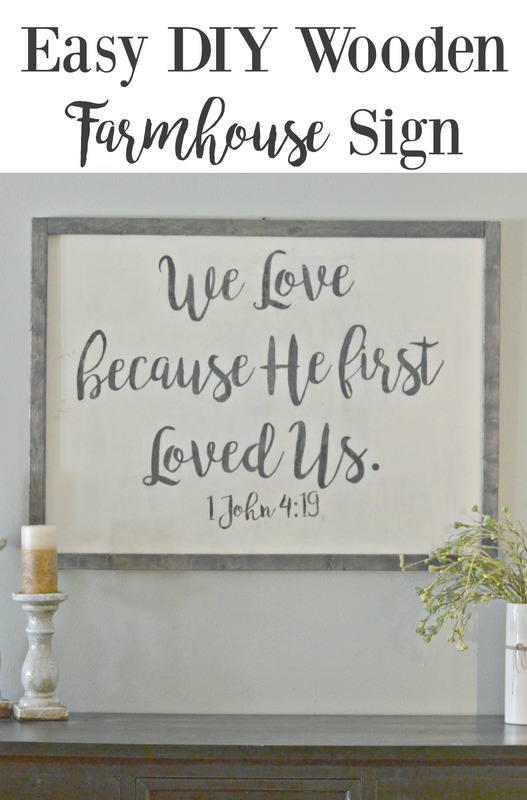 So there you have it, 2 super easy techniques to transferring graphics to wood and 2 super easy diy tips to creating a farmhouse look wooden sign. I promise you both of these signs were nearly fool proof. If you are dying for the farmhouse rustic look like I am you will love these! I love your bible verse sign! Thank you for the instructions. I have made several wooden signs, however, I have never tried this method for letter transfer. I typically trace the letters outline with a stylus that leaves a faint impression and then hand paint all the letting. That causes a lot of hand cramps during the tracing portion! Everything is explained well, but could I request a picture of the back to see how you do the studding? I am a visual learner and this would help me understand this portion of your instructions greatly. Thank you in advance!! Hey Shelby! Let me see if I can get one but it’s really nothing fancy. We just used 2 nails in the back and tied the wire to the nails to hang it. What font did you use for the bible verse sign? I love this and need you to make one for me 😉 Did you have the verse printed out at an office supply store?? I would also love to know what font you used for the bible verse! Thank you! Hi! I was able to go on picmonkey to create and image but was unable to figure out the font sizing. You said you used poster size for printing but I’m not seeing that anywhere. What size font did you use? Thank you! ‘Lucinda, To use her free lettering of the Bible verse just right click and “save as”. It will save it as a jpeg. Hope that helps. Channing, Thank you SOOO much for sharing the mirrored image and tutorial. This is lovely and I cannot wait to try this method. Using the modge modge letter transfer was a great idea! I currently am making signs sort of like this for my Etsy shop and it’s difficult to get that lettering down correctly 🙂 So glad I found this on Pinterest! I am interested in purchasing the font you used on your bible verse. Can you tell me what it is? ok i’m really confused because I bought 30 in and 32 in studs and they aren’t long enough for the 30×40 in board? Amy I missing something? 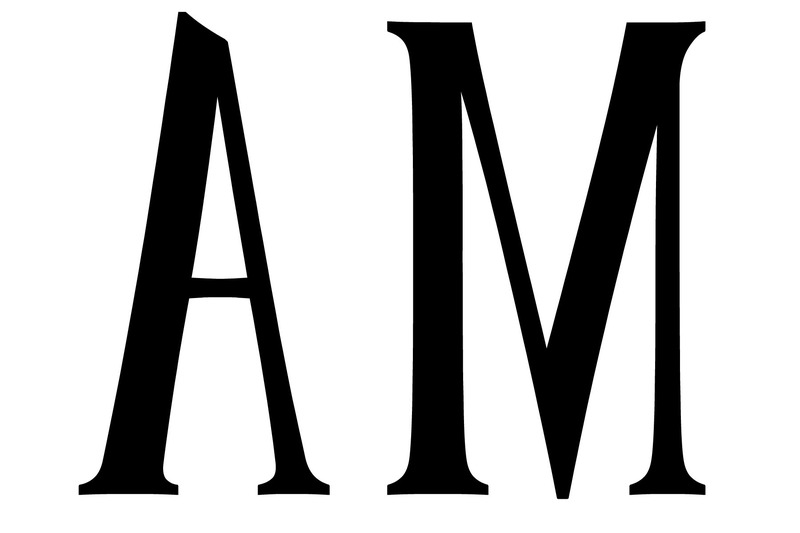 What font did you use for the Bible verse? This is fabulous!! I cannot wait to use these techniques! Were you able to use just a regular printer for this? ?